Timpanogos Storytelling Institute | Hauntings – What can we learn from a good scary story? Hauntings – What can we learn from a good scary story? Can you think of the first really scary story that you heard? Perhaps it was a ghost story at a sleepover, or an urban legend around a campfire. Do you remember how you felt? If you are like me, you probably felt fear and excitement simultaneously. What is it that draws us to these stories? Is it just the adrenaline rush, or is there something we can learn about ourselves in these dark corners? 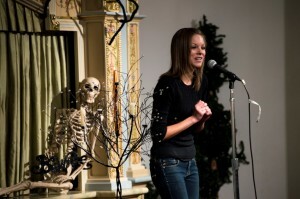 Tonight is the Timpanogos Storytelling Festival’s Hauntings Storytelling Competition and I can’t think of a better way to treat yourself this Halloween than with some spine-tingling stories. Forget those gory slasher movies, give me a good old-fashioned cerebral scare any day. 1. Dragons do exist, but they can be defeated. This applies to monsters, demons as well. If we have the courage to find their weaknesses, we can prevail. 2. Stories can be scary but predictable, which life rarely is. Like a roller-coaster ride, there is anticipation, drama, a predictable climax and then the satisfying conclusion. For the adrenaline junkie, it is a safe thrill. 3. Often, scary folklore is created by cultures to warn people against bad behavior. Think of the ghost stories in which someone returns from the dead to settle unfinished business because they did something wrong in life or someone did something to them. Think of the scary fairytales warning children to stay away from strangers or not to go into the woods alone. When these stories were originally published children were often facing very real and perilous dangers every day. There are real dangers today that we must be on the watch for. 4. We can gain a sense of control over our own demons and monsters when we take the time to stare them down. 5. We stumble into closeness when sharing a good scare with someone else. The shared screams, gasps, and nervous laughter cause us to cling to one another and remind us that we really aren’t alone. Contemporary myths, urban legends, ghost stories, folklore and fairytales can not only provide us with entertainment but with insight as well. A good scary story will take you to dark places in order to enlighten you. 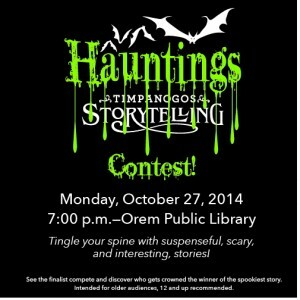 Whatever it is that draws you in, surrender yourself and come to the Haunting’s Storytelling Competition on Monday at 7 pm at the Orem Library. It’s free, it’s frightening, it’s fun and you might just learn something about yourself.